New York Rep. Alexandria Ocasio-Cortez was just caught is a blatant lie. The 29-year-old, embarrassed from her New Green Deal ideas is insisting that they are not what the news is reporting. “There are multiple doctored GND resolutions and FAQs floating around. There was also a draft version that got uploaded + taken down. There’s also draft versions floating out there. “Point is, the real one is our submitted resolution, H.Res. 109,” she said. To cover her tracks she deleted the FAQs page from her website so no one could fact check her … she thought. 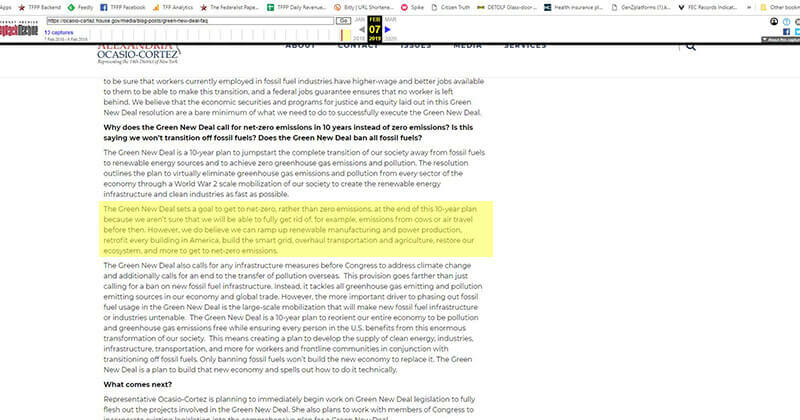 But what she forgot is that the Internet has something called The Wayback Machine and we were able to obtain these copies of exact what her Green New Deal page said. We have included the link for you to fact check it yourself. A job with family-sustaining wages, family and medical leave, vacations, and retirement security, High-quality education, including higher education and trade schools. High-quality health care, Clean air and water, Healthy food, Safe, affordable, adequate housing. An economic environment free of monopolies, Economic security to all who are unable or unwilling to work. Exactly what she said that it did not say it says and that is why she removed it from her website. She also did call for the elimination of cow farts and airplanes. “The Green New Deal sets a goal to get to net-zero, rather than zero emissions, at the end of this 10-year plan because we aren’t sure that we will be able to fully get rid of, for example, emissions from cows or air travel before then. However, we do believe we can ramp up renewable manufacturing and power production, retrofit every building in America, build the smart grid, overhaul transportation and agriculture, restore our ecosystem, and more to get to net-zero emissions,” the FAQ read. And the whack job did also say that every home and building would have to be rebuilt. “We don’t need to just stop doing the destructive things we are doing (like using fossil fuels for energy needs); we also need to start doing new things (like overhauling whole industries or retrofitting all buildings to be energy efficient). Starting to do new things requires upfront investment. In the same way that a company trying to change how it does business may need to make big upfront capital investments today in order to reap future benefits (e.g., building a new factory to increase production or buying new hardware and software to totally modernize its IT system), a country that is trying to change how its economy works will need to make big investments today to jump-start and develop new projects and sectors to power the new economy. “Merely incentivizing the private sector doesn’t work – e.g. the tax incentives and subsidies given to wind and solar projects have been a valuable spur to growth in the US renewables industry but, even with such investment-promotion subsidies, the present level of such projects is simply inadequate to transition to a fully greenhouse gas neutral economy as quickly as needed. “This resolution sets out a non-exhaustive list of several major projects that need to be completed fast. These projects include upgrading virtually every home and building for energy efficiency, building 100% greenhouse gas neutral power generation systems, removing greenhouse gases from industry and agriculture, and more. These projects will all require substantive investment,” it said. Thanks to our good friends at The Federalist Papers for permission to republish this material.